Amy is happy with her life - so don’t you dare judge her choices. She has a great apartment in New York, a sought after job as a journalist and she is perfectly happy with her romantic status. She is in a very open relationship - but that’s how she likes it. For Amy calls the shots in her own life and avoids intimacy like the plague. She’s learnt well from her philandering father (Colin Quinn). Even her own sister Kim (Brie Larson) finds her impossible at times. However, all this begins to change when she is handed an assignment to write about pioneering sports surgeon, Aaron (Bill Hader). At first she thinks he is just another one night stand. But then he wants her to stay and, scarier still, he wants to spoon. Can Amy handle her growing feelings for Aaron or will she do everything in her power to push him, and a chance for real happiness, away? Click Here To Receive Weekly Film News, Reviews And Events! I have an issue with rom coms. Typically I find that they fall rather flat - being neither funny enough to be called a comedy nor convincing enough to be a true romance. This made Trainwreck a really pleasant surprise. This film is laugh out loud funny from the start to the finish. The jokes are pretty racy as the film’s 15 rating would imply (Click here to see the BBFCInsight on Trainwreck). The first half of Trainwreck features one relationship gag after another as well as heavy drinking and some (comedy) drug taking. This is all to show us that the female lead in this rom com is not like those we have seen before. This is not a girl who desperately wants a man. This is not a girl who has been cheated on or been betrayed by a man in the past. No, if anyone is doing any cheating it’s Amy herself. She is selfish, dishonest and insensitive. She is snarky and dismissive of her sister’s marriage and growing family. And she doesn’t allow herself to care - indeed, emotional numbness is her preferred state. Despite being, on the face of it, pretty unlikeable, I really loved Amy. She is brilliantly played by stand-up comedian, Amy Schumer, who also wrote the film’s screenplay. I really felt like Schumer poured all of her very best material into this film. Trainwreck allows us to see why Amy is the way she is - largely thanks to the example set by her father. We care about Amy because we know that, deep down, she is a good person. She's just a little broken, emotionally. As soon as we see Aaron we know that he is the man to save Amy from herself. Well, this is a rom com after all. Aaron is different. Brilliantly portrayed by Bill Hader, he is not just after a one night stand. He even calls the next day - much to Amy’s horror. Aaron is a genuinely good guy and I couldn’t help but root for him. Of course, the path of true love doesn’t run smooth. 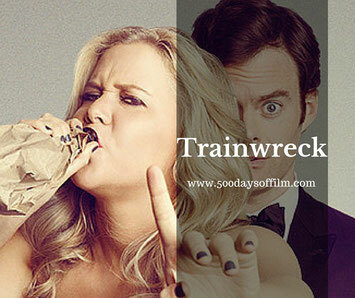 However, Trainwreck doesn't become contrived. It pretty much avoids most of those irritating rom com traps. I really cared about Amy and, while I didn’t want her to change into sap mode (which she doesn't), I really hoped that things would work out for her. I enjoyed Trainwreck so much that I have now watched it twice. I think I enjoyed it even more the second time around. Both times it left me with a lasting feel good factor. It is just great to see a film that is both laugh out loud funny and undeniably romantic. I can see that the sense of humour in Trainwreck may not be everyone’s cup of tea. It is pretty brash at times. However, it did make me laugh out loud and I am just so glad that we seem to have moved on from gross-out gags. There are some great cameos in Trainwreck. I particularly enjoyed LeBron James and thought John Cena's 'performance' was hilarious. Have you seen Trainwreck? If you have, let me know what you thought of this movie - just leave me a comment in the box below!